Christian theologian; born July 4, 1793, at Ahrensböck, Holstein; died at Bonn in 1859. After a preparatory course at the gymnasium of Lübeck and two years of philosophical study at Kiel, he entered the University of Berlin, where he studied under Schleiermacher, De Wette, and Neander; becoming tutor at the university in 1818, and assistant professor in 1823. In 1829 he was appointed professor of theology at Bonn, which position he held until his death. The researches of Bleek were devoted principally to the Old and New Testaments. His work in the former field only will be considered here. 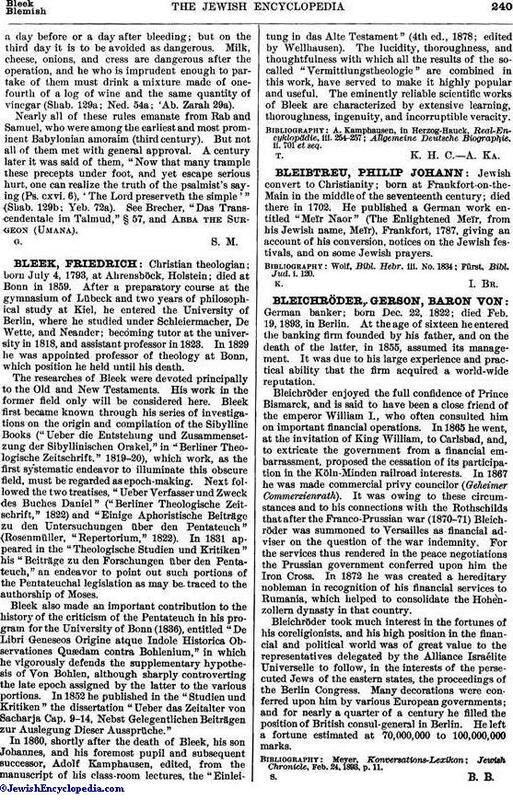 Bleek first became known through his series of investigations on the origin and compilation of the Sibylline Books ("Ueber die Entstehung und Zusammensetzung der Sibyllinischen Orakel," in "Berliner Theologische Zeitschrift," 1819-20), which work, as the first systematic endeavor to illuminate this obscure field, must be regarded as epoch-making. Next followed the two treatises, "Ueber Verfasser und Zweck des Buches Daniel" ("Berliner Theologische Zeitschrift," 1822) and "Einige Aphoristische Beiträge zu den Untersuchungen über den Pentateuch" (Rosenmüller, "Repertorium," 1822). In 1831 appeared in the "Theologische Studien und Kritiken" his "Beitrüge zu den Forschungen über den Pentateuch," an endeavor to point out such portions of the Pentateuchal legislation as may be traced to the authorship of Moses. Bleek also made an important contribution to the history of the criticism of the Pentateuch in his program for the University of Bonn (1836), entitled "De Libri Geneseos Origine atque Indole Historica Observationes Quædam contra Bohlenium," in which he vigorously defends the supplementary hypothesis of Von Bohlen, although sharply controverting the late epoch assigned by the latter to the various portions. In 1852 he published in the "Studien und Kritiken" the dissertation "Ueber das Zeitalter von Sacharja Cap. 9-14, Nebst Gelegentlichen Beiträgen zur Auslegung Dieser Aussprüche." In 1860, shortly after the death of Bleek, his son Johannes, and his foremost pupil and subsequent successor, Adolf Kamphausen, edited, from the manuscript of his class-room lectures, the "Einleitung in das Alte Testament" (4th ed., 1878, edited by Wellhausen). The lucidity, thoroughness, and thoughtfulness with which all the results of the so-called "Vermittlungstheologie" are combined in this work, have served to make it highly popular and useful. The eminently reliable scientific works of Bleek are characterized by extensive learning, thoroughness, ingenuity, and incorruptible veracity. Allgemeine, Deutsche Biographie, ii. 701 et seq. T. K. H. C. A. Ka.